BOSTON, May 8, 2018 – Forum Systems Inc., a pioneer in API security technology, today announced that the Info Security Products Guide has named the Forum Sentry API Security Gateway a Gold winner in the API (Application Programming Interface) Management and Security category of the 2018 Global Excellence Awards®. API Security is complex! Vendors like Forum Systems, IBM, CA and Axway have invested almost 2 decades of engineering effort and significant capital in building API Security stacks to lockdown APIs. 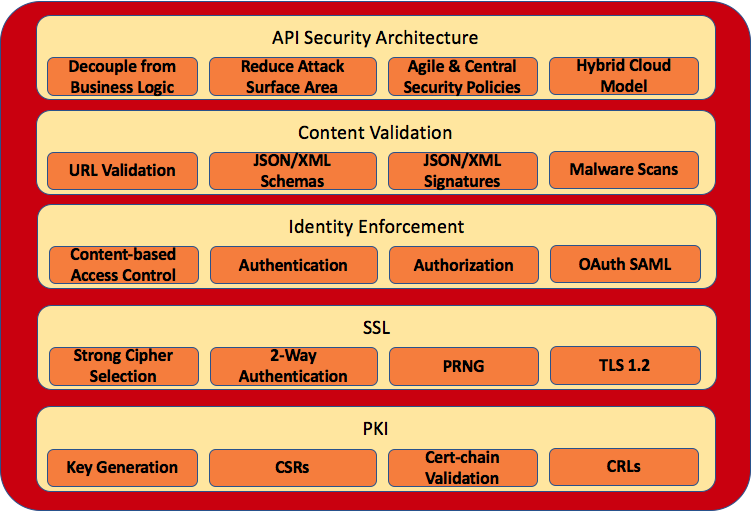 The API Security stack diagram shown below is essential for rapidly locking down APIs. In this article, we review “The Four Pillars of API Security” — SSL, Identity, Content Validation and Architecture. Before addressing the Four Pillars of API Security, it is essential to recognize that a robust PKI is a must for enterprise-grade API Security. Without proper key life-cycle management, the API Security Pillars cannot be built. A revolution is occurring in European banking and APIs are leading the way. To accommodate the rapid rise of new online payment providers – third-party payment providers (TPPs) – the European Commission proposed a revision in 2013. Building on the PSD’s key principles, PSD2 was ‘born’ to make payments safer and more secure, enhance consumer protection, foster innovation and promote competition while ensuring a level playing field for all payment service providers. In force since 2016, EU Member States must implement PSD2 by January 2018. In October, one of the signature security events in the history of the internet occurred. Dyn, the well-known cloud-based internet performance management company, suffered a massive DDoS attack on its managed domain name server infrastructure. The impact was widespread. BOSTON, December 8, 2015 – Forum Systems Inc. today announced significant enhancements to its flagship Forum Sentry API Gateway that enable enterprises to achieve seamless, secure integration with multiple cloud providers while satisfying users’ ever-increasing demands for anytime, anywhere mobility through the flexibility of Single Sign-On (SSO). BOSTON, October 12, 2015 – Forum Systems Inc. announced today that it will be showcasing its award-winning API Security Management solutions at key cybersecurity events, including the 2015 ISSA International Conference and SC Congress Chicago. Forum Systems will be showcasing Forum Sentry in Booth #103 at the 2015 ISSA International Conference, taking place October 12-13 at the Chicago Marriott Downtown.